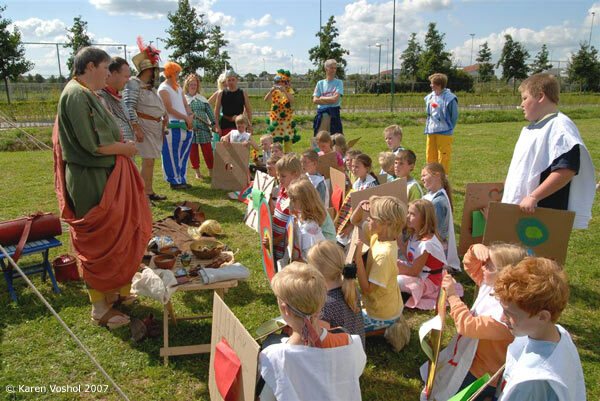 Every summer, the last week of the summer holidays in my home town Houten is celebrated with a feast week for the children. 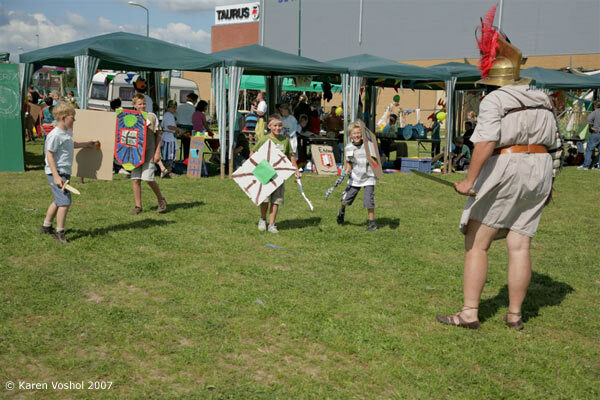 The (then) village started the event called 'Fladderen' (Flapping) in 1976 with 230 children, and more than 30 years later the event is booked solid with 1200! 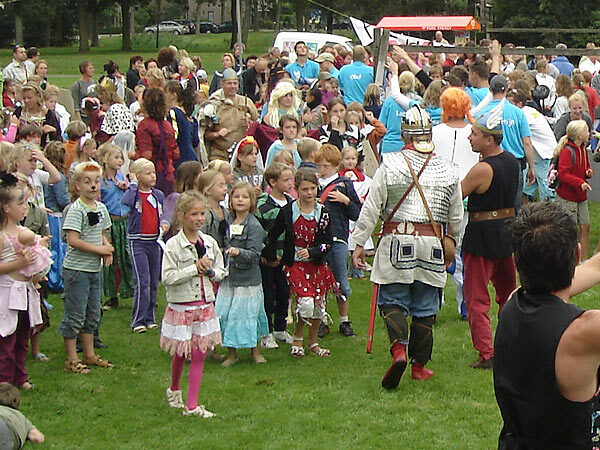 Fladderen uses ten locations for several age groups, with about a hundred kids at each location. 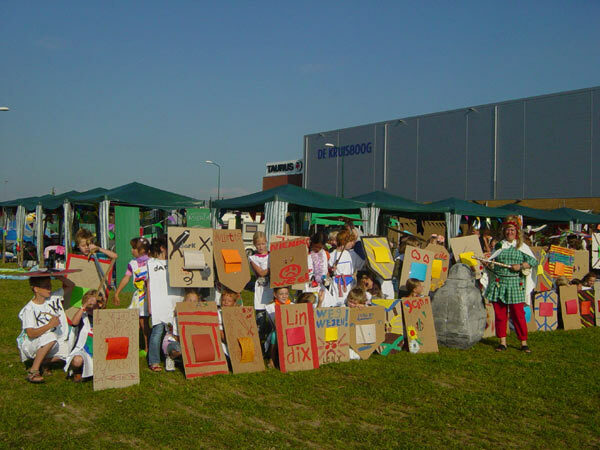 My location was the Kruisboog ('Crossbow'), a large sports complex at the eastern edge of town, where a very large grass area was at everyone's disposal. 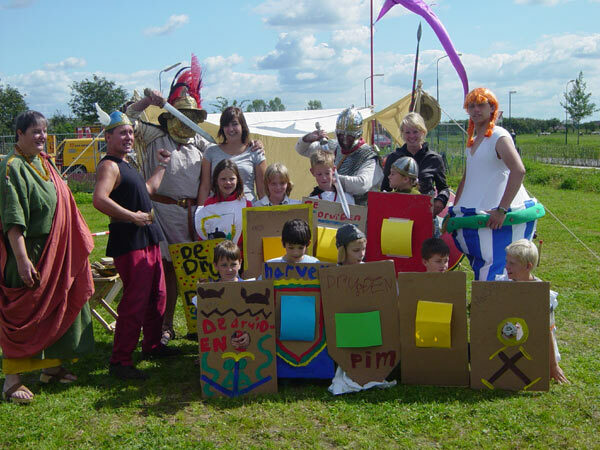 the theme was 'Asterix & Obelix, with the Romans as nasty spoilsports.. 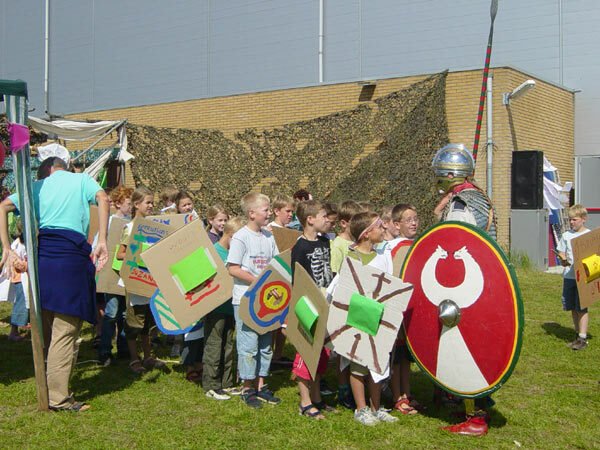 The event opened with all the groups together at a school in Houten. Our two kids also took part, and after seeing them off I hastened back to get all the stuff together and race to the event area. 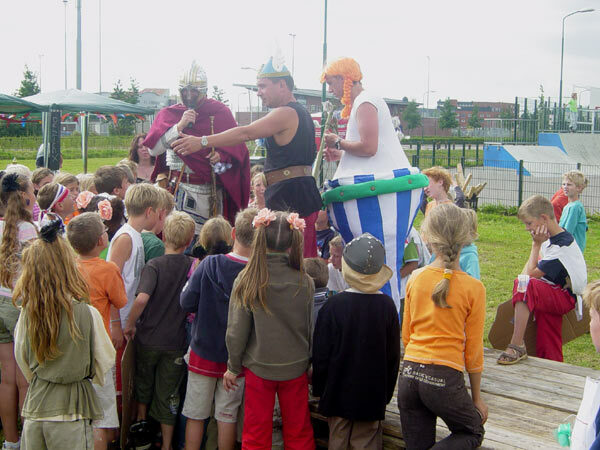 Asterix and Obelix at the opening, busy telling the kids about the plans for the next three days. 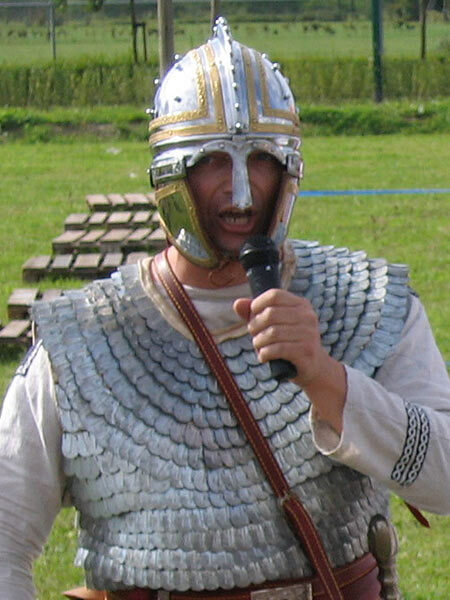 ..and he's from the limitanei! 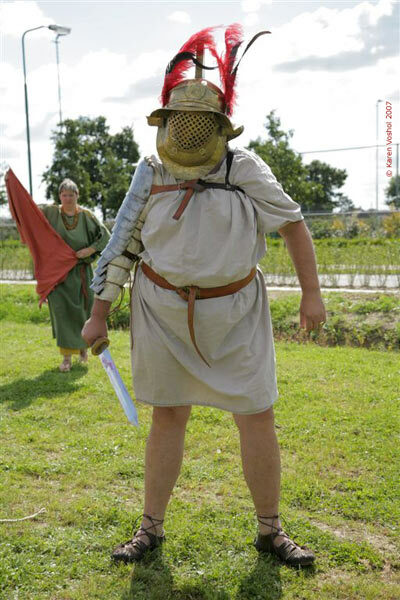 Together they are the proud Fectienses legion! 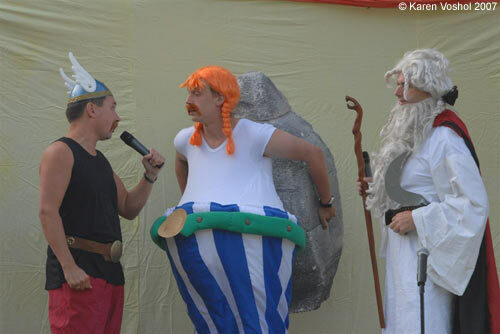 Asterix and Obelix tried to convince Ceasar's representative of their lost cause..
After anouncing that the road will be built within two days.. 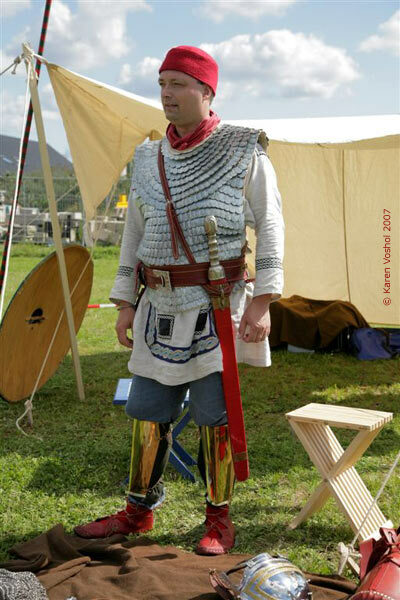 It was a bit of a fast affair, but within a very short time the Fectienses had doubled the amount of soldiers they usually have. 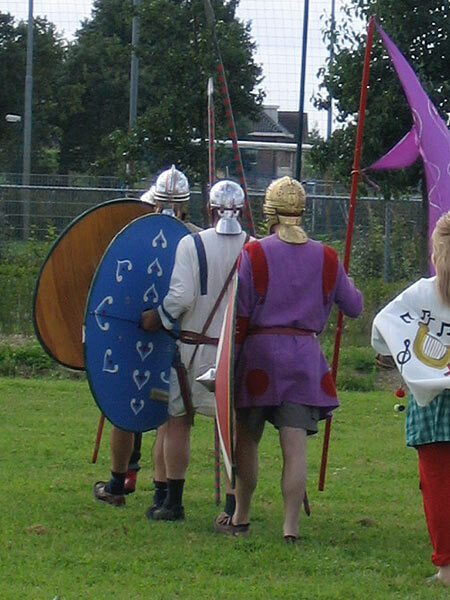 Three strong men (who build up the stages for the event) volunteered to make up the numbers of the legion, before we confronted a hundred children. When we marched across the field, we kinda startled them, especially when we anounced that a road was to be built right acrosss their village! 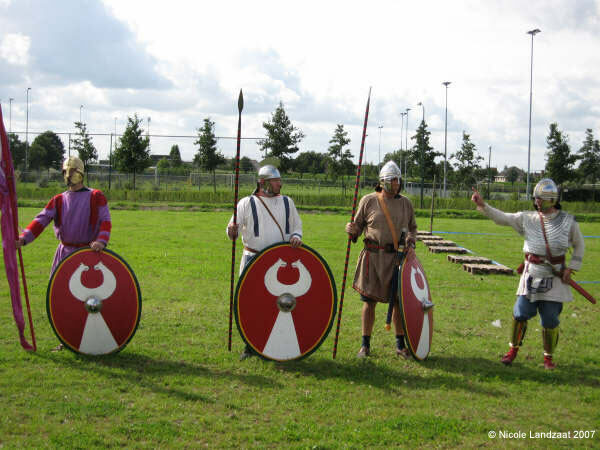 Some wanted to attack there and then, but Asterix and Obelix had other plans. So we delivered the message and marched of again. Part one done. 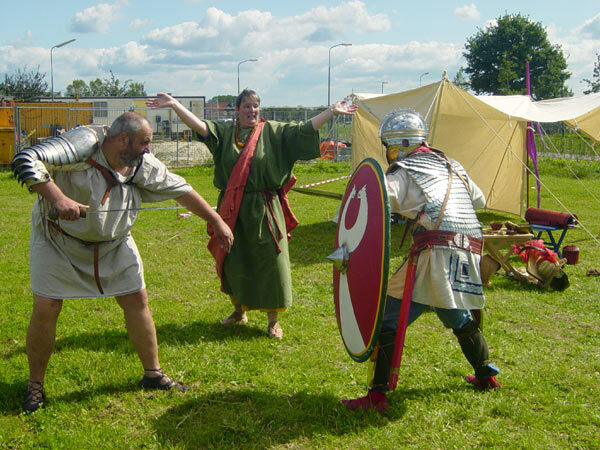 The next day, the Romans returned - to bring civilization to the Gauls! 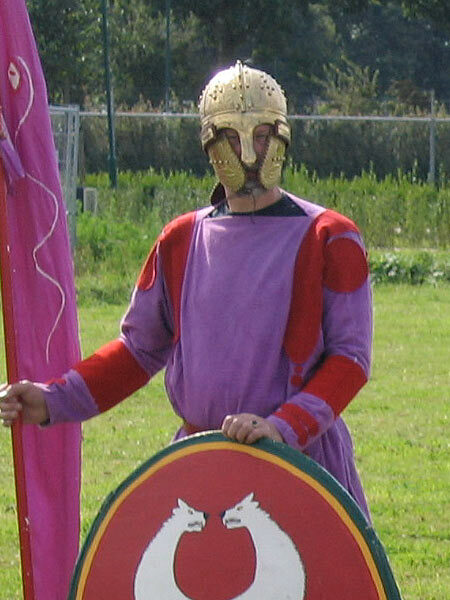 This time I had brought no volunteers, but the professional help from two members of the Principate group Corbvlo. 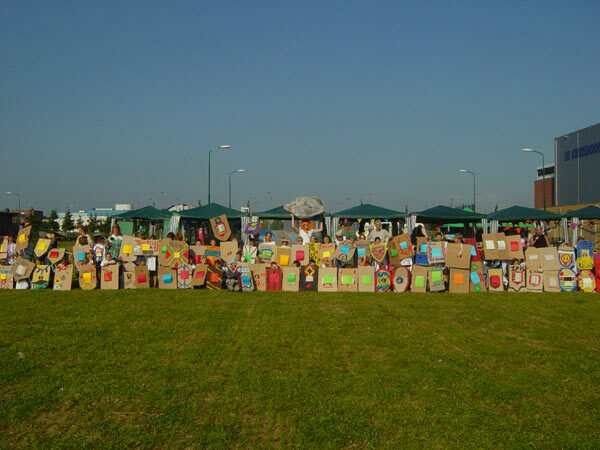 We set up camp on the green, a good hundred yards from where the children (about a hundred of them) had built their 'village'. The weather was still very good and we were met with much enthusiasm. Rounding up the kids in their camp. Some wanted to fight! 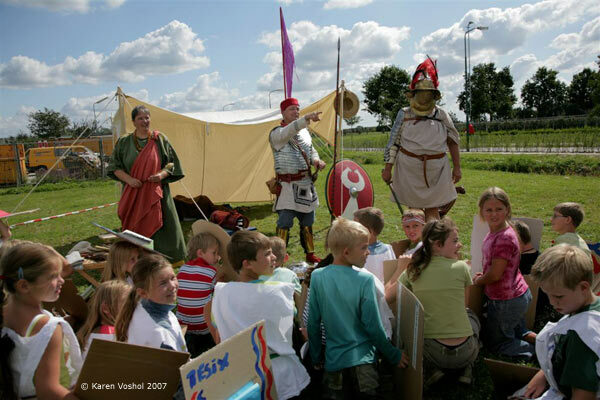 The Romans show the Gallic chuildren about the Roman Empire..
... and about what happens if they decide to resist! Grrr! 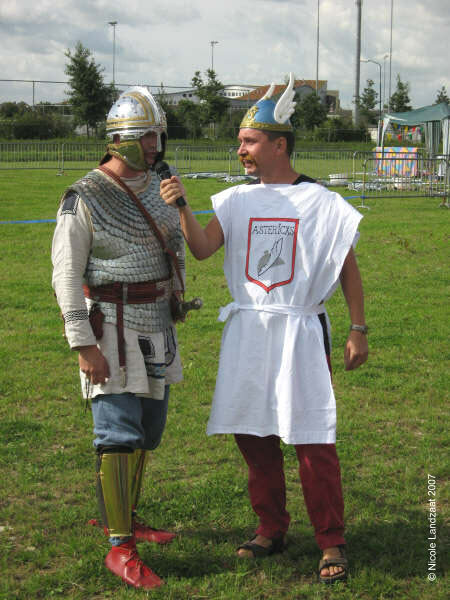 Apparently, the leaders of the Gauls know what is good for them! After every class, the 'graduates' get a group portrait. 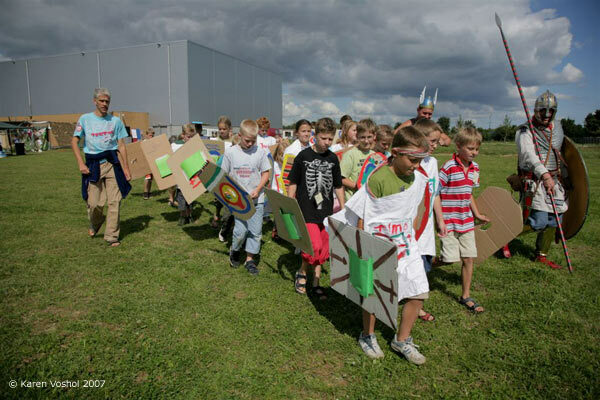 The efforts of Roman civilization lessons become visible. 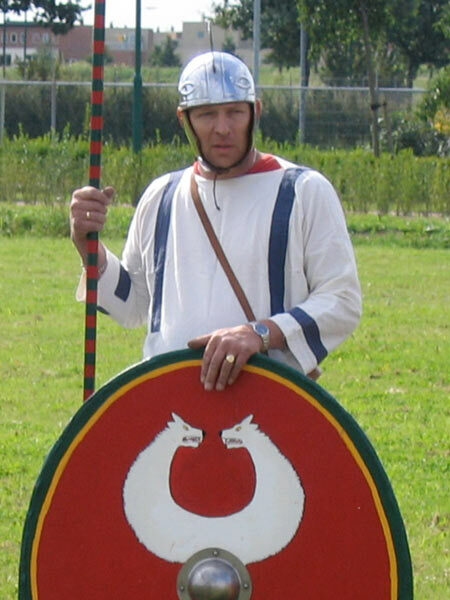 After which the Romans get back to what they are good at - civil war! We invited groups of about ten children to come over, and I marched them off to our end of the field (or tried to, anyway). 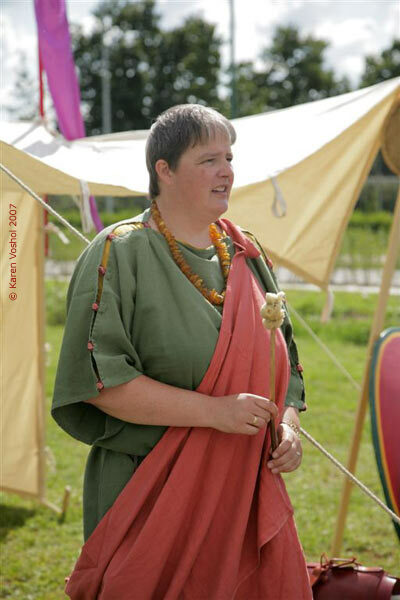 For about one and a half hour, Romilia/Hanneke gave them lessons about Roman cleanliness, showing the softness of the skin after a good Roman shaving. 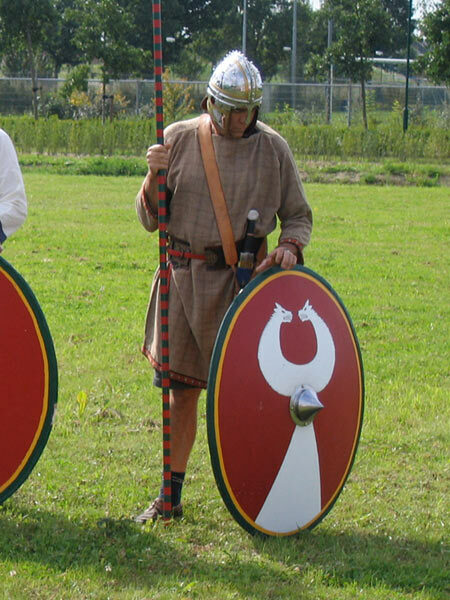 After that, Traumatiucus/Gerard and myself showed them the hardness of Roman arms and armour. That would give them something to think about for tomorrow, when I would return to decide if their camp could stay or if it would have to be destroyed... Part two done. 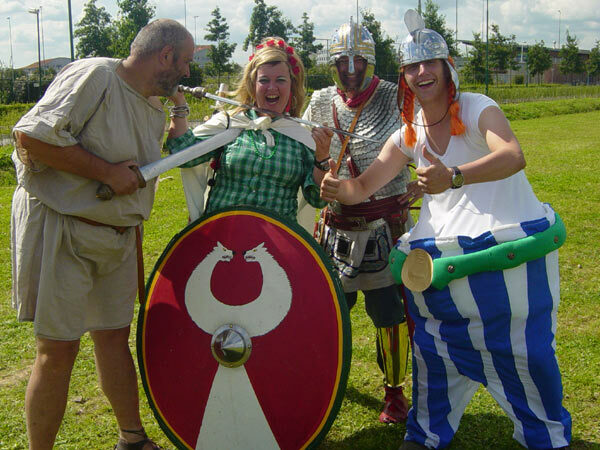 The last day, and the Gauls have built themselves an army! 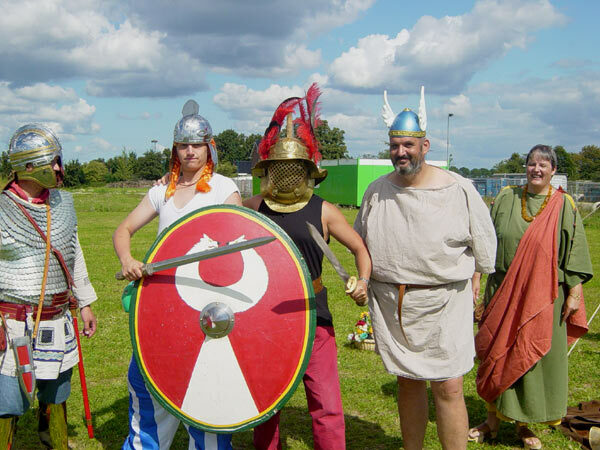 Impressive, almost a century of Gauls ready to defend their village. 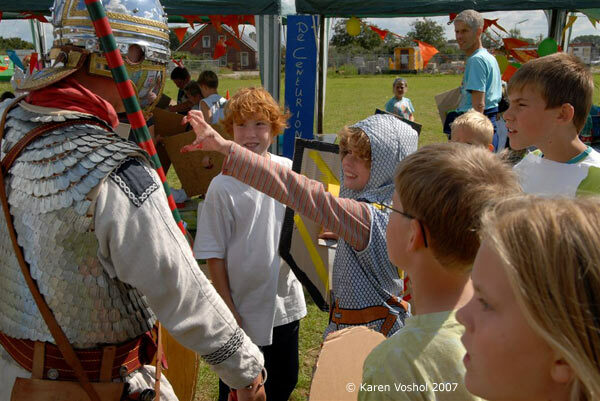 But when I arrived, they decided not to fight but to bribe me! All ended well, and we all returned to the big closing ceremony. 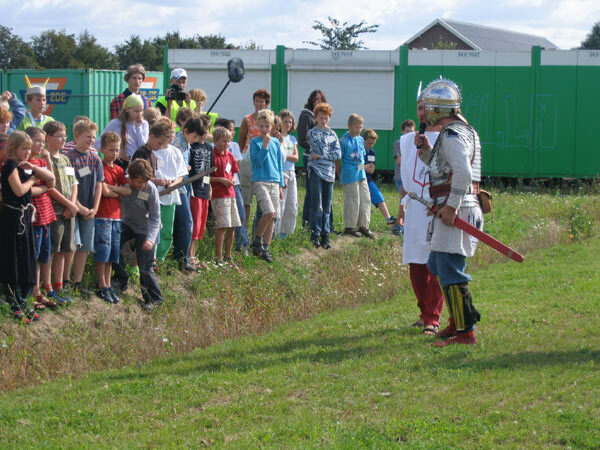 The last day, and in the afternoon I went back alone, to tell the Gauls if they could stay or not. 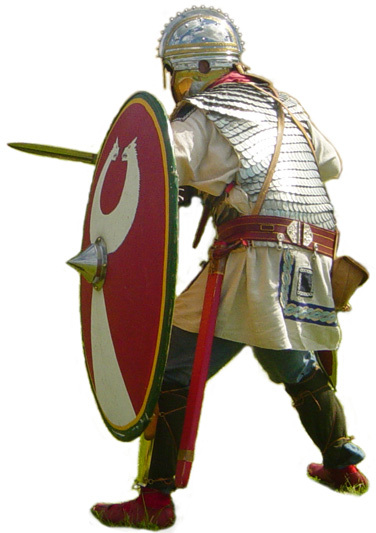 They had in the meantime built themselves quite an army, with a wall of fine painted shields. Of course, it did not come to any fighting, because the kids decided to bribe me with gold (painted rocks) and flowers. So I decided to yield and change to course of the 'road', and everybody rejoiced. 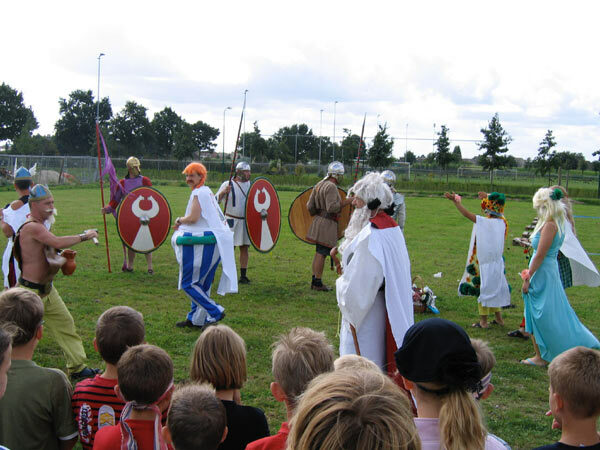 That ended the three days' camp, and while the volunteers took down the village (yes, the Romans prevailed anyway), we returned with the children to the big closing ceremony, where the mayor ended a very good event after three days. As if on cue, that's when the first rain fell.